Since 1999, CITT-Certified Logistics Professionals and articling participants have dedicated themselves to continuous learning through participation in the CITT Certification Maintenance Program. Continuous professional development is one way CITT ensures their members remain industry's elite. As such, regular career maintenance is actively encouraged. It is an absolute necessity for both the integrity of the CCLP designation and for the credibility of your own professional qualifications. You can download a guide to certification maintenance and instructions on how to log your activities here. 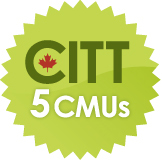 As a CITT-Certified Logistics Professional or an articling participant, you are required to accumulate 50 certification maintenance units (CMUs) over a two-year cycle. See the list below for ways to acquire CMUs. You can also look for the CMU symbol shown here. It may appear on an email or webpage to quickly and easily show you how many CMUs you can earn by participating in the learning activity being promoted, for example. The current two-year cycle began on January 1, 2018 and ends on December 31, 2020. Learning units should be reported to CITT annually when you renew your CCLP certification and pay your member dues. How can I Earn CMUs? Definition: Business or industry-related training sessions or programs. Units: 2 units per hour of training; maximum 10 units per day. Definition: Participating in CITT events and activities. Units: Unit allocations depend on the type of activity. Definition: Semester-long, business or industry-related program with a formal assessment component i.e., graded assignments and/or exam. Courses may be classroom-style or via distance education (correspondence) or the Internet. Shorter, non-graded courses fall under heading #1. Units: 45 units for the successful completion of a semester-long course. Definition: Addressing an audience on a topic that is business or industry-related. Units: 5 units per hour of public speaking. Units: 45 units for teaching or facilitating a semester-long course. For shorter courses calculate 2 units per hour of classroom time. 1.5 units per hour for marking CITT exams and reports (maximum 25 units per year for marking). Definition: Reading business or industry-related information. Units: Maximum of 5 units per year in this category. Definition: Original writing with a research or technical component on a business or industry-related topic. Units: Unit allocations depend on the type of writing. See below. Definition: Participating and being involved in an industry-related, volunteer activity in an on-going capacity. Units: Maximum 5 units per year in this category. For more information, download your full copy of the CITT Certification Program Manual. Questions? Contact Jennifer Traer at jtraer@citt.ca.